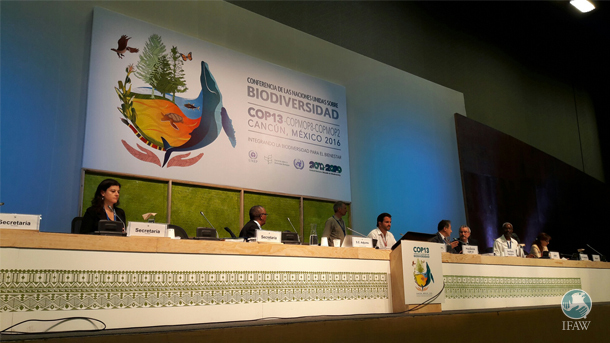 Yesterday, after an opening ceremony held by the Mexican government, the 13th Conference of the Parties of the Convention on Biological Diversity (CBD CoP13) officially started in Cancun, Mexico. CBD is a United Nations multilateral treaty confirmed by 196 countries that gather every two years to discuss major threats to biological diversity as well as to develop strategies for the conservation and sustainable use of biological diversity. Prior to this opening, from December 2 to 3, select ministers of environment, agriculture, fisheries, forestry and tourism from countries party to the Convention—known as the High Level Segment (HLS)–gathered under the theme “Mainstreaming Biodiversity for Wellbeing,” to set up the framework of the Convention’s negotiations under a document called the “Cancun Declaration On Mainstreaming the Conservation and Sustainable Use of Biodiversity for Well-Being”. It is encouraging to see governments taking a multi-sectoral approach to promote sustainable practices within different economic sectors to reduce threats to biodiversity and promote its conservation and sustainable use. IFAW will be present during the Convention, to share with the Parties our concerns and recommendations on several of the issues addressed in the convention such as: tourism, fisheries, biodiversity and climate change, biodiversity and human health, ecologically or biologically significant marine areas, invasive alien species, risks associated with trade in invasive alien species sold via e-commerce, biological control of invasive species and sustainable wildlife management. December 8: Effective Partnerships for Youth Engagement in Biodiversity Conservation: the Youth Forum for People and Wildlife. December 14: Wild Animal Welfare, Conservation and Human Wellbeing: New Synergies to Enhance Biodiversity and Sustainable Development. December 16: Effective Government-NGO Collaborations: Changing Public Attitudes and Behaviors to Support CBD Objectives. We look forward to sharing more about each of these events in the coming days.